“Cogito ergo sum.” This famous Latin phrase comes from French philosopher René Descartes in the early 1600s. Translated into English, it means “I think, therefore I am.” It’s actually a profound philosophical idea, and people have argued about it for centuries: we exist, and we are aware that we exist, because we think. Without thought or the ability to think, we don’t exist. Do you agree? Even if you think Descartes got it wrong, most would say that thought is intimately connected to being human and that, as humans, we are all thinking beings. Thinking is the mental process you use to form associations and models of the world. When you think, you manipulate information to form concepts, to engage in problem-solving, to reason, and to make decisions. Thought can be described as the act of thinking that produces thoughts, which arise as ideas, images, sounds, or even emotions. Many great thinkers and theorists have dedicated their lives to the study of thought, trying to understand exactly how humans receive, absorb, generate, and transmit thought—and also how they learn. One such thinker was Benjamin Bloom, an American educational psychologist who was particularly interested how people learn. In 1956, Dr. Bloom chaired a committee of educators that developed and classified a set of learning objectives, which came to be known as Bloom’s taxonomy. This classification system has been updated a little since it was first developed, but it remains important for both students and teachers in helping to understand the skills and structures involved in learning. What exactly are learning objectives? You may have already noticed them—like the ones at the top of this page—throughout this course. Learning objectives are goals that specify what someone will know, care about, or be able to do as a result of a learning experience. These learning skills can be divided into three main categories or “domains”: the cognitive domain (what you should know), the affective domain (what you should care about), and the psychomotor domain (what you should be able to do). Since this section of the course is focused on patterns of thought, we’ll start with the cognitive domain of learning. The cognitive domain of learning is divided into six main learning-skill levels, or learning-skill stages, which are arranged hierarchically—moving from the simplest of functions like remembering and understanding, to more complex learning skills, like applying and analyzing, to the most complex skills—evaluating and creating. The lower levels are more straightforward and fundamental, and the higher levels are more sophisticated. See Figure 1, below. The following table describes the six main skill sets within the cognitive domain. When you are skilled in remembering, you can recognize or recall knowledge you’ve already gained, and you can use it to produce or retrieve or recite definitions, facts, and lists. Understanding is the ability to grasp or construct meaning from oral, written, and graphic messages. When you apply, you use learned material (or you implement the material) in new and concrete situations. When you analyze, you have the ability to break down or distinguish the parts of material into its components, so that its organizational structure may be better understood. With skills in evaluating, you are able to judge, check, and even critique the value of material for a given purpose. With skills in creating, you are able to put parts together to form a coherent or unique new whole. You can reorganize elements into a new pattern or structure through generating, planning, or producing. You can explore these concepts further in the two videos, below. The first is from the Center for Learning Success at the Louisiana State University. 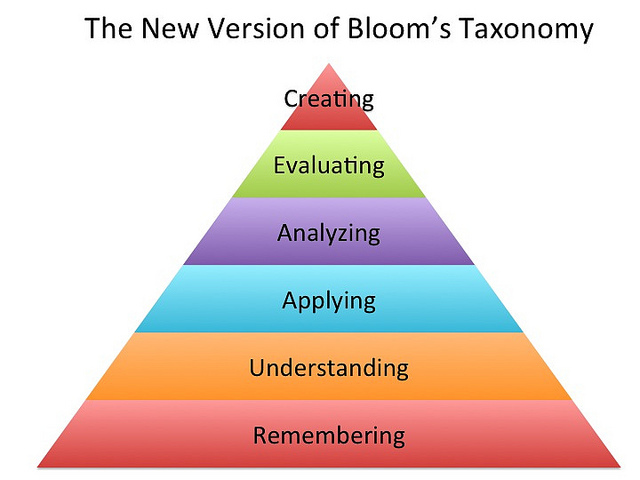 It discusses Bloom’s taxonomy learning levels with regard to student success in college. This next video, Bloom’s Taxonomy Featuring Harry Potter Movies, is a culturally based way of understanding and applying Bloom’s taxonomy. You can download a transcript of the video here. From Bloom’s taxonomy of learning skills, you can see that thought and thinking can be understood as patterns—systems and schemes within the mind. There is order and structure in the way we think and in the way we process and internalize information. As we look at patterns of thought, we can also think about the power of thought. As a result of many amazing and potent research and discoveries, the scientific community is learning a great deal about how plastic, malleable, and constantly changing the brain is. For example, the act of thinking—just thinking—can affect not only the way your brain works but also its physical shape and structure. The following video explores some of these discoveries, which relate to all the thinking and thoughts involved in college success.